How Can I Determine Which Motor I Have? Well luckily, there’s a very easy way to determine specifically which motor is powering your car. 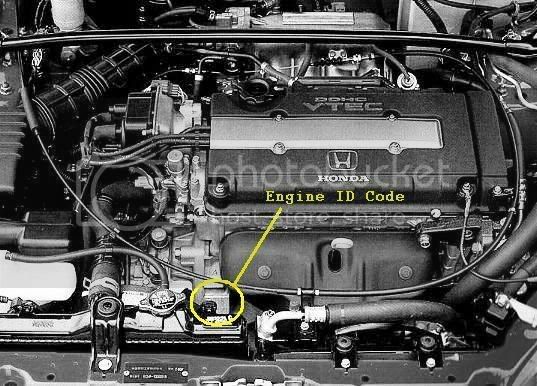 The engine identification code, as well as the motor’s serial number, is engraved onto every single Honda engine block. You can find the code on the exhaust side of the motor, to the left of the exhaust manifold, up near where the block meets the head. Depending on the origin of the motor (Japanese market versus American or other non-Japanese markets), the engine ID code will be either four or five characters long** (ex: B16A, or D16Z6). 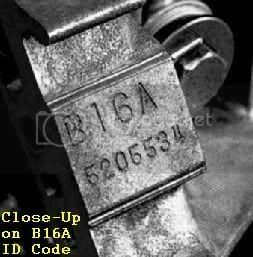 Typically, the seven digit serial number will be engraved below the engine ID code. On some older models, the engine’s ID code and serial number can also be found on the engine bay identification plate, typically printed together on one line. *Note: This is the typical code location for 4 cylinder Honda engines; for V6 engines or other variants, the location of the engine ID code and serial number may vary. **There are some exceptions to this rule; once again, please refer to the link above for a thorough explanation of Honda’s engine ID code system. Last edited by 94accordex; 12-07-2007 at 01:36 AM.